Functional Integrative Rehabilitation Education - Why do we look down sometimes? The long story today involves the vestibular system. It is a part of the nervous system that lives between your ears (literally) and monitors position, velocity and angular acceleration of the head. There are three hula hoop type structures called “semicircular canals” (see picture above) that monitor rotational, tilt position and angular acceleration, as well as two other structures, the utricle and saccule, which monitor tilt and linear acceleration. The vestibular apparatus (the canals and the utricle and saccule) feed into a part of the brain called the floccular nodular lobe of the cerebellum, which as we are sure you can imagine, have something to do with balance and coordination. This area of the cerebellum feeds back to the vestibular system (actually the vestibular nucleii, all 4 of them! superior, inferior, medial and lateral); which then feed back up to the brain (medial, inferior and superior nuclear pathway) as well as down the spinal cord (the lateral pathway) to predominantly fire the extensor muscles. Look at the picture. 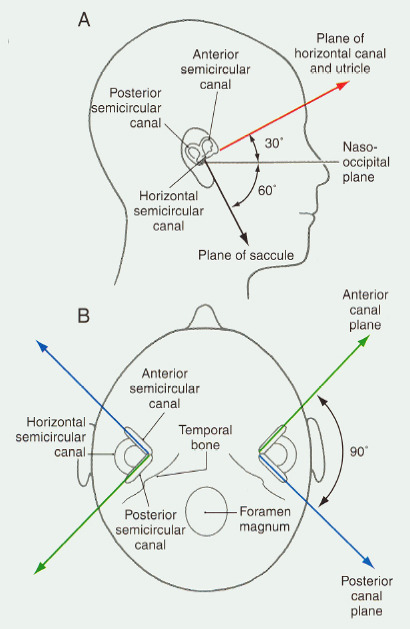 Notice the lateral semicicular canals are 30 degrees to the horizontal? If you are standing up and extending your head , that lateral canal becomes vertical and the fluid inside (emdolymph) cannot flow, making it much less useful to the nervous system. Thats why it is hard to stand with your head extended and eyes closed and maintain balance (go ahead and try it, feeling is believing). Conversely, when we flex our head forward(like looking down to see what our footing looks like), we move this lateral canal onto a more physiologically advantageous position, enhancingour balance. If you are on uneven ground, have an injury or are having issues with proprioception (like many folks do), this actually helps the vestibular system (as well as the proprioceptive and visual systems) to work more efficiently. OK, have that? Now one more concept.. So if we look down, we put a slow stretch into our neck extensor muscles, which just happen to have some great postural receptors in them, called muscle spindles, along with mechanoreceptors in the capsules of the joints. So, facilitating (ie. exciting) these receptors, fires more information into our cerebellum, the queen of balance in the nervous system. What do you think happens? Even better balance and coordination! The 2 systems work together, summate to improve movement and balance!